Atlanta Beltline: Outdoor Adventure Your Family Will Treasure! The Atlanta BeltLine is one of the jewels of the city. It connects areas of Atlanta that you just ‘can’t get to from here’ and encourages neighbors to get out of their cars and explore this beautiful city. The Atlanta BeltLine is built on former railroad paths and when complete, will be 22 miles of continuous trails circling Atlanta and connecting 45 neighborhoods. Lots of people walk the Atlanta BeltLine, but we think the best way to see it is to get a bike rental. After spending time in bicycle friendly Breckenridge CO, Sue’s family came back to Atlanta with a different outlook, more experienced riders and a desire to find some great places to bicycle Atlanta. The Atlanta BeltLine fit the bill perfectly. Whether you have your own, or need a bike rental, Atlanta BeltLine Bicycle is the place to go. This neighborhood, family friendly shop is your one stop for rentals, purchases, repairs, and tune ups…and it is sitting right on the Atlanta Beltline in the O4W district. Our family decided to rent bikes one weekend, to explore Art on the Beltline. The little guy can’t ride yet, and the big guy is still learning. We needed something for everyone, so we picked up the Surrey. Mom and Dad pedal, while the kids ride in front! Here’s the scoop on the Surrey…it is not easy! But the boys loved it, and we made lots of new friends along the way because everyone wanted to know about it! If you are looking for something more traditional, bike rental is only $15 a day. Tandems, trailers, and hybrids are also available. One final note, a friend bought a used bike here for her kids. She always remarks on how kind and helpful the staff was to her family, and what a great value the purchase was. Something to keep in mind if you decide to purchase your own! At some point the Atlanta BeltLine will be a continuous trail, with spurs off of it, but at the moment, there are only out and back trails. In addition, there are numerous spurs that connect existing parks, that aren’t technically the BeltLine, but are part of the system. This can be confusing, because I’ve seen Atlanta BeltLine maps that show what it WILL be more often than I see what IS currently completed, and then the spurs add another layer altogether. This Atlanta BeltLine map brochure is a good reference guide. We rode several of the trails. Here is our take on the various sections. 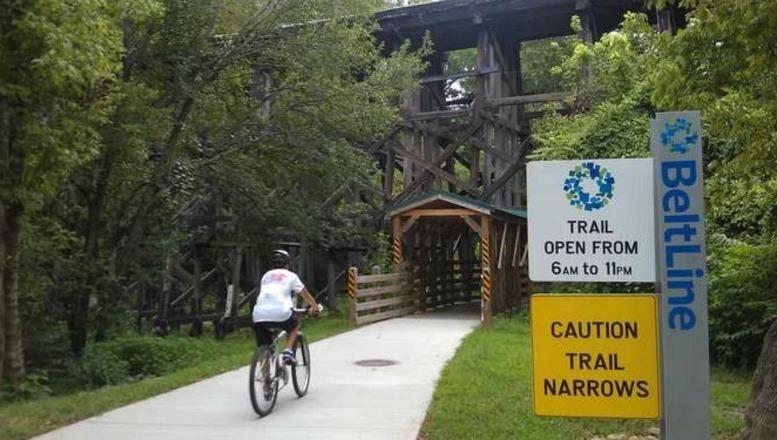 There are five sections of the Atlanta BeltLine: Eastside Trail, Northside Trail, Southwest Connector Spur Trail, West End Trail, and Interim Hiking Trails. My only complaint about the BeltLine is that it’s difficult to figure out where to get on the trails and which trails are currently open. Before you head out, go to the Atlanta BeltLine website and click on the trail you’re planning to visit. In addition to the latest information, they’ll also tell you how to access the trail. Here are three trails currently open for bicycling Atlanta on the BeltLine. We’ve been on each of these and we’ll tell you where to park and what to expect. The Atlanta BeltLine trials we’ve done have been paved and flat, perfect for the novice rider, or even the child on training wheels. The Northside Trail is short but has lots of playgrounds and fun bridge underneath a railroad tressel. Length: About 1 mile from Ardmore Park through Tanyard Creek Park. Where to Get On: Parking is available at Tanyard Creek Park along Collier Road (there is a sign that says Tanyard Creek Park). You’ll have to look for the entrance to the BeltLine, it’s not well marked and easy to miss. What You’ll Find: Along this route are two playgrounds and a large field where we saw kids playing baseball. At one point you go under a railroad tressel through a bridge, which was quite fun. There is some cool artwork painted under the viaducts too. In 2015, the PATH Foundation completed a Northside Spur Trail. This adds a third of a mile to this trail and takes riders along Bobby Jones Golf Course,though Bitsy Grant Tennis Center, and up Northside Drive. 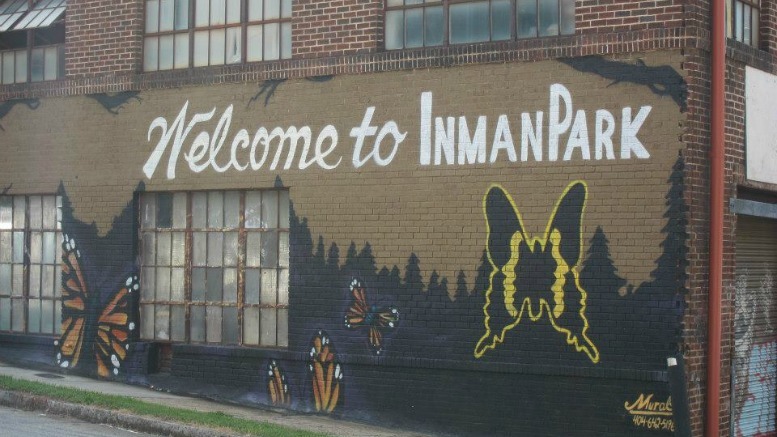 The Atlanta BeltLine Eastside Trail goes through several historic neighborhoods, including Inman Park, and the shopping district Ponce City Market. Length: 2 miles from 10th St. (tip of Piedmont Park) and Monroe Drive to Irwin St.
Where to Get On: Park on the street at 10th Street and Monroe or in the pay lot at Park Tavern restaurant at the corner of 10th and Monroe. Be careful parking around here, they will boot your car if it’s not in an approved space. What You’ll Find: At the moment, this is the best section of the BeltLine and most easily accessible. It was interesting to me to view the city from this perspective. As anyone who has been to East Atlanta knows, they have fabulous neighborhoods but you just can’t get there from here. Along the BeltLine, we easily rode through some of Atlanta’s most historic neighborhoods like Virginia Highlands, Poncey Highland, Old Fourth Ward and Inman Park. Ponce City Market is a fantastic place to take a break and do a little shopping, or visit some great restaurants – the Holman and Finch burger and fries are not to be missed – especially the fries. And you won’t find a more delicious ice cream than Honeysuckle. The Eastside Trail includes the Old Fourth Ward Skate Park. Bring your board, or just watch. We stopped to watch skateboarders at the Old Fourth Ward Skate Park and play on the playground. We watched as Alex Rodriguez’s sculpture Whirling Wheels was installed along the route and I pined for more time so we could visit a few of the shops and restaurants in Inman Park. In Inman Park, we branched off on the Freedom Park Trail, just a short distance from the Carter Center, and Virginia Highlands. Length: 2.4 miles from White Street to Westview Cemetery and includes the historic West End, Mozely Park and Westview. Where to Get On: We got lost in a not so great neighborhood trying to find the trailhead. We finally found the trail and parked on the street in a neighborhood where I wasn’t sure whether it was ok or not to park. The Atlanta BeltLine website often suggests parking along streets in neighborhoods – but I’m not sure that’s a great idea. Long story long, not sure where is the best parking for this trail. If you have a suggestion, let me know. What You’ll Find: The ride to Westview Cemetery was along a busy roadway and of the three sections, this one had the fewest people on it. Gordon White Park is a pretty pocket park, but I’d like to see more areas like this along this trail. This apparently was the trail I thought I was going on when I found the West End Trail. I was looking for the splash pad at D.H. Stanton Park in Peoplestown which looks like a lot of fun and is open May 1 thourgh Oct. 1. I’m still not clear if the BeltLine actually hooks up to this park yet or this is a future trail. It’s listed on their website, but I can’t find it on any of the trails. The Atlanta BeltLine has spurred new development, as well as some super fun community programs. Here are a few of our favorites. The annual Art on the BeltLine is an extra incentive to bicycle Atlanta. Art of the BeltLine showcases temporary visual and performance art along all of the trails. We watched as they installed one of the sculptures along the Eastside loop. In addition to sculpture and paintings, there are also performances. 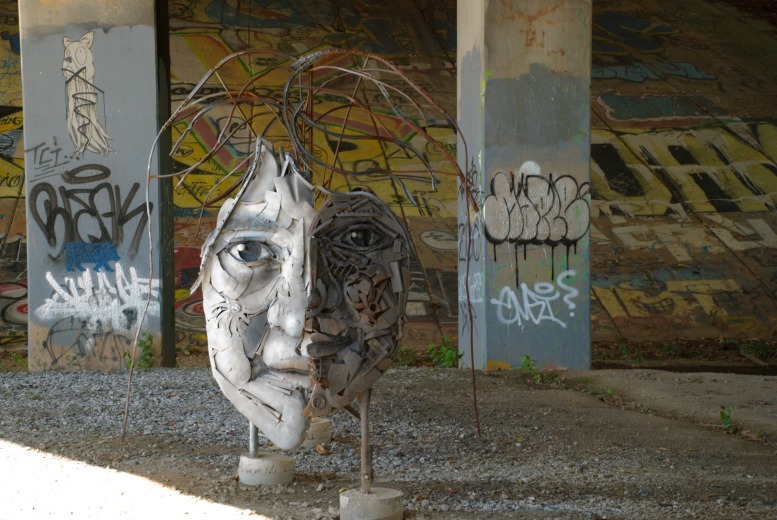 Another great public art project that you can see at various stops along the BeltLine. My boys love these! What’s more fun than a parade? How about a parade at night. The Atlanta BeltLine lantern parade was the first of it’s kind in Atlanta and has become a city tradition. Each fall, founder Chantelle Ryder and the Krewe of the Grateful Gluttons host lantern making workshops before the community parade in September. Whether you walk in the parade or just watch, this is a must do event. The Nature Conservacny “If Trees Could Sing” is an engagement program in partnership with Trees Atlanta that was installed in spring 2016 on the Atlanta BeltLine. Specially decorated trees with custom signs and QR codes connect visitors with testimonials from more than two dozen musicians (Reba McEntire, Amy Grant, Bela Fleck, Ben Folds, Taylor Hicks, Atlanta-based rapper Eightball and singer Kristian Bush, plus pending new videos from Georgia-based musicians including Chuck Leavell) about their favorite tree species and the importance of conservation. Be the first to comment on "Atlanta Beltline: Outdoor Adventure Your Family Will Treasure! [Video]"